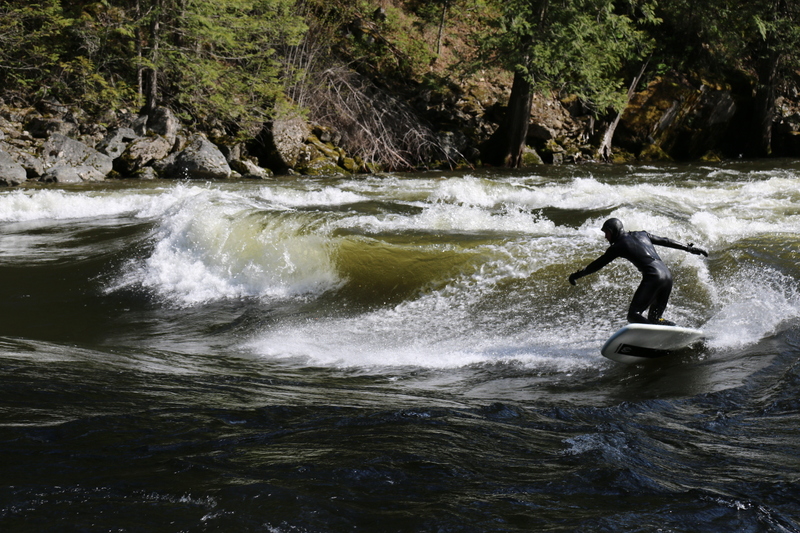 Home › All Products › SK8 5' 0"
The ultimate river surfing board; short, but with enough volume to rip even the smallest waves. It’s unique shape has plenty of volume in the nose to allow you to stay on the wave without purling. With a nod to our roots as skaters, the SK8 has a concave deck and traction all the way to the nose to keep the board connected to your feet. 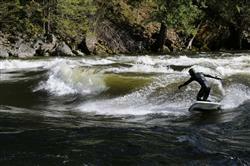 The 5'0" is 48 liters and sized for smaller riders or faster river waves. The SK8 is built with a traditional epoxy surfboard layup, the same layup we use to build custom boards for our pro riders. .This board is built for performance over durability. If durability is a priority, please consider an inflatable board. There is no warranty on the SK8 once it has been on the water. SK8 River Surfboard from Badfish SUP on Vimeo. My favorite board hands down! I fell in love with shortboarding thanks to the sk8's. If i go out to prone river surfer, this is my go-to board. Nice volume so I can surf most waves even if there's a bunch of mush and whitewater. The rounded pin tail carves and releases super well and so light, its easy whip around. comfy and grippy deck padding so no need for surf wax. Honestly my favorite board and have more fun on this board than any other board. This board is super fun to ride! It caters well to beginners all the way up to advanced riders! The Sk8 is a little higher volume board then you would usually see in the line up and it’s great. With this extra volume it stay in pocket haves better then smaller boards would and it also helps ease the pop up for beginner riders! The Badfish Sk8 is my go to short board! The Sk8 changed my shortboard surf game. From pop-ups to push-ons, green waves to foam piles, this board has brought my surfing to the next level. Love the full deck traction and how lightweight the board is. I love the sk8 because it is capable of surfing so many waves. I learned on it last year at high water on big glassy waves but then as the season ended and waves got foamy or only smaller ones were still in, I could still surf whereas more ocean style boards could not.